Colombia is fashionable. In 2016, it was host to 5 million foreign tourists, twice as many as 3 years previously. The world is falling for “Narcomania”. Pablo Escobar may have been killed by the police 25 years ago, but his memory lives on. Top of the box office: the films and TV series that tell the life story of the Medellin cartel’s boss. Juan Pablo, his eldest son, goes from studio to studio to plug his book. The latest video game hit, “Narcos”, allows you to relive the life of the Medellin cartel’s boss. We met a young Frenchman, Jules, a rising DJ and, Christophe, a young Belgian entrepreneur. Like many Europeans, they fell in love with Colombia and decided to settle here. Today, the country is one of the most dynamic in Latin America and one of the least violent since the FARC, which terrorized the country during a 50-year war, signed a peace treaty. And yet, Colombia remains the largest producer of cocaine. 34% up on 2015. For two months, we scoured the country in search of what they don’t want to show. In the heart of Medellin, we went looking for the heirs of Pablo Escobar. The “new narcos” are making much more money today than the Medellin cartel’s boss made in his. We met Popeye, Escobar’s former lieutenant, boss of the hitmen. 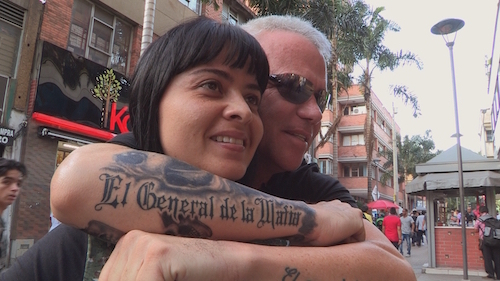 After spending 23 years in jail and claiming 250 murders, he is now free and he’s the new star of Medellin. Everybody wants a selfie with him. We went looking for the narco tours, the secret tourist industry on the trail of Pablo Escobar. We discovered that Roberto, Escobar’s own brother, is making a fortune from Pablo’s image. Colombia is selling its past. We discovered the “Farc Tour”, latest of the tour operators. For €250 per head, you can now have lunch deep in the jungle with a Farc platoon. Finally, we tried to understand why hippopotamuses, African animals, have been introduced into Colombia. From Cartagena, the pearl of the Caribbean, to Medellin, the city of eternal spring, via the Choco jungle, a journey into the heart of one of the most astonishing countries in the world.